Western Ghats, like the Amazon, form the ‘girdle' of the earth to maintain ecological balance, invoke monsoons and provide a cushion for climate change. Kochi: The third Western Ghat Manifesto, prepared by the Save Western Ghat Forum, a collective of civil society organisations based in Kerala, Karnataka, Goa and Maharashtra and released on April 8 is a comprehensive document on the urgent requirement for the conservation of the gtas and the means to achieve it. A. Western Ghats, like the Amazon, form the ‘girdle' of the earth to maintain ecological balance, invoke monsoons and provide a cushion for climate change. The mountainous corridor along the west coast is a distinct ecological continuum that is nature's best gift to the country. Called Western Ghats, this narrow 1,700 km strip that stretches from the mouth of Tapti in Dhule district of Maharashtra to Kanyakumari in Tamil Nadu is nature's unique evolutionary laboratory still at work. It is the Monsoon gateway to the sub-continent when its ecological riches pull the strong oceanic currents to offload their first showers on the landmass. B. Western Ghats, older than the Himalaya, is one of the 34 global hotspots of biodiversity - flora, fauna, landscape and ethnicity. Western Ghats is replete with bewitching locations that are home to known 4,050 type of plants, 121 frogs, 508 birds, 6 types of turtles and terrapins, 87 species of snakes, 63 types of lizards and a wide variety of large mammals. New species are still being discovered in this biodiversity hotspot where some 325 globally threatened species occur. Shrinking Water Towers: The forest cover in Western Ghats, as per scientific guidelines, should be 66 per cent of the total geographical area in the hilly region. Unfortunately, the forest cover in the Western Ghats hill region is less than 35 per cent (that too in fragmented state) on account of forest clearance for unmindful development. This has had adverse impact on the water security of the peninsular India. 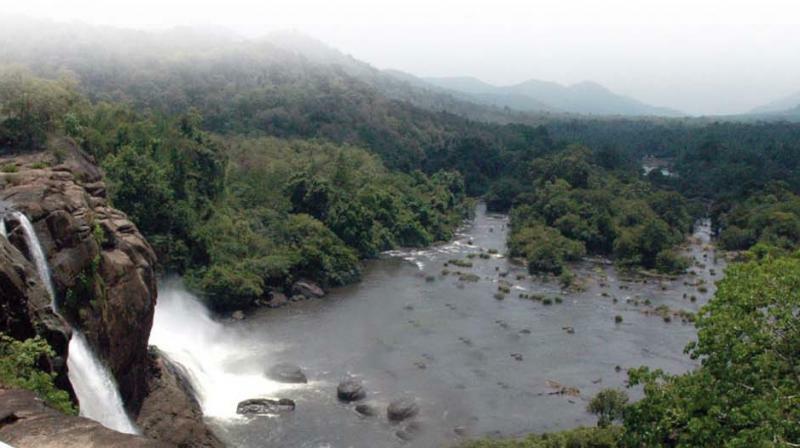 As catchments of most peninsular rivers like Cauvery, Krishna, Tunga Bhadra and Periyar originate in Western Ghats, it is essential to conserve these forests to secure water security of south Indian states. It is imperative to conserve existing natural forests and regenerate natural forests with indigenous tree cover because the unique biodiversity exists only in such forests, and not amidst monoculture plantations of exotic species. Despite heavy rainfall in July-Aug 2018 the scarcity of water in the Western Ghats region across six states has proven the need to maintain the green cover. Man-Animal Conflicts: Forests are the sole and rapidly shrinking habitat of wildlife and any forest encroachment accelerates man-animal conflict. Forest conservation and wildlife protection go hand in hand but the erroneous perception is that priority to wildlife triggers such conflicts. Both are complementary to each other and the need of the hour is to instill confidence among the forest dwelling tribes that their livelihood is secured through conservation of wild animals and habitats. This enhances the natural capital as well as provides ecological security for the human beings and wildlife. There should be no compulsory resettlement of villages from the national park or sanctuary. Indigenous people and tribes should be given access to non-timber forest produce. Dam induced destruction: Silent Valley struggle created history by stopping the hydro-elecric dam project for saving forests and wildlife in the Western Ghats. Nevertheless there are renewed attempts at harnessing each of the flowing rivers in Western Ghats called 'mini hydro projects' to generate hydro power by building dams. There is an urgent need to review the performance of these dams before building new structures. Eroding agriculture diversity: Agricultural crisis in Western Ghats need to be addressed differently as it has distinct zones - coastal, hill terrain and the edge of the ghats - requiring special attention. The impending climatic change calls for a system of agriculture that is resilient to such changes. Western Ghats has rich diversity of farm and plantation crops that need to be promoted at the expense of high yielding varieties, for securing local food and economic security and for providing sanctuary to wildlife. Threatened tribal livelihood: The forest dwelling tribes in Western Ghats represent a unique diversity of cultures that co-habit within forest ecosystems. Their resource base of natural forests is shrinking at a faster rate, affecting the livelihood opportunities like collection of non-timber forest produce. In order to provide livelihood security, the Forest Right Act 2006 needs to be effectively implemented. Community control over forest resources, in addition to rights over land, can guarantee livelihood security with the added benefit of forest and diversity conservation. MNREGA needs to be implemented specifically for ecological rehabilitation, and resolving the human wildlife conflict in Western Ghats. Thermal and nuclear power plants: There are attempts to establish a series of power projects along the coastal belt of Western Ghats to generate captive power. Though it might be strategically important to locate these power projects on the coast due to cheap import of coal and raw material, it will be counter-productive to the ecosystem fragility in Western Ghats in the long run. Given the distinct ecosystem that is Western Ghats, any such attempt will alter the micro climate weakens the ecosystem resilience and leads to the destruction of the famous alphonsomangoes from Ratnagiri in Konkan and the spices from Western Ghats, among other irreversible changes. It will have serious impact on aquatic diversity and fish catch in the estuaries and on the coast. The emphasis should be to promote alternate energy resources. Destructive infrastructure: The host of infrastructure projects like building new roads, rail lines, widening the existing highways in the forests and the location of heavy industries in the region are bound to damage the existing natural resources. It is essential to review the location of entire infrastructure projects and prioritise those which have least impact on the eco-systems and those that do not displace people, pollute the river systems, fragment the existing forests and cut off wildlife corridors. Expanding capital intensive five star tourism need to be discouraged and brought under strict regulation. Diverting rivers: There are numerous attempts to link and divert rivers flowing in the west to be linked to the east flowing rivers (Yeetinhole in Karnataka). This kind of engineering of the rivers and diverting their natural course are bound to create irreparable ecological, social and economic impacts on the downstream including loss of 'ecological flows' in rivers, causing hardship to people and forests on the west coast. It is essential to reconsider and halt such diversion of rivers in Western Ghats. Reckless mining: Mining is one of the major causes of destruction of tropical forests in Western Ghats. Sand mining has also caused the chocking of rivers and river courses, but it has destroyed the regenerating capacity of the land and forests. Mining has come to a halt temporarily due to the intervention of the Supreme Court. There is a need to do fresh thinking on extension of mining leases. It must be made mandatory for the lessee to follow the polluter pay principle and comply with environment and rehabilitation laws. Nilgiri Biosphere Reserve: Nilgiri Biosphere Reserve comprises 5500 sq.km area covering the maximum extent of protected areas (national parks, tiger reserves and wild life sanctuaries) in Karnataka, Tamil Nadu and Kerala. Without a legal status given to the reserve, there is apathy from all the state governments with lack of proper coordination and administrative hassles. This region should be made a model Biosphere Reserve which will help maintain ecological security of these three states.